Smoke Inn has become a leader in the industry for collaborating on special cigar projects with some of the industry’s most talented manufacturers, creating legendary products worthy of any collector’s humidor. For our latest project, we head to uncharted territory, crafting an exclusive, ultra-limited cigar out of Costa Rica. Using an Ecuadorian Habano wrapper over a select Costa Rican binder (exclusive to Smoke Inn) and specially selected Dominican filler leaves, we are proud to present the Smoke Inn 8 Ball. 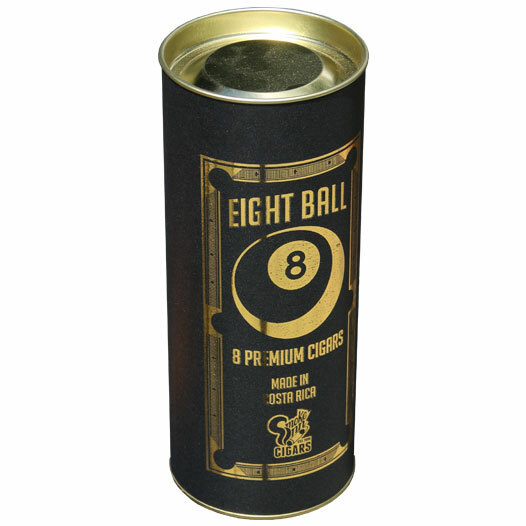 8 Ball has been rolled in a singular 6.5”x54 vitola, making for the optimal smoking experience for this special blend. Because of the rare tobaccos used, the cigars have been limited to 200 tin-sealed canisters—each loaded with 8 premium cigars! Expect a smooth, medium-full-bodied smoke, brimming with classic, Cubaneque flavors of nuts, vanilla, hay, and buttered toast. This is an exclusive, limited edition cigar—the allotment has been limited to a single run of only 200 canisters—make your orders fast while supplies remain!